We are pleased to introduce ourselves as the Manufacture & Value Added Distributor of Orthopedic Implants based out of Delhi. Our extensive range of the trauma implants are manufactured using internationally graded AISI 316L material & in customized sizes as per the requirements. 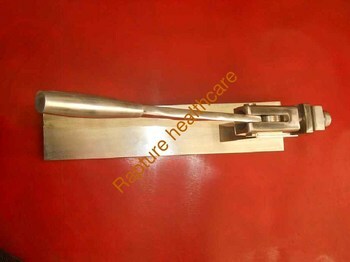 We also have complete range of orthopedic instruments, external fixator & spinal products available with us. We have ready stock available for vast range of products and same will be offered at very competitive prices. Currently we are providing our products to various dealers from all part of the country and keen to expand our network further. Through this communication, we are hoping to start a fresh alliance with your esteemed organization & will ensure to provide quality products on regular basis with-in the stipulated time frame. Enclosing the product catalogue and company profile for your reference. In case of any clarification, please feel free to write back or speak. Look forward to your kind support and cooperation towards building up a long term relationship with your organization.